Stewart-Haas Racing (SHR) is enjoying the best of its 10 years in the Monster Energy NASCAR Cup Series in 2018, already winning seven races and putting all four of its Ford Fusions in the top-10 in the standings after 18 races. No. 14 Haas Automation VF-1 Ford Fusion driver Clint Bowyer repeatedly says there is “an army” that backs him up each weekend that includes SHR’s drivers, teams, pit crews, executives, shop personnel and corporate partners, plus key competition partners like Ford Performance and Roush-Yates Engines. But Bowyer also reminds everyone that success starts at the top with SHR’s co-owners Tony Stewart and Gene Haas. All in the racing world know of Stewart’s talents behind the wheel and his influence in overseeing the organization, but Haas also plays a role in SHR’s achievements. The world is starting to see that, as well. Haas formed Haas Automation in 1983 and, in the 35 years since, turned it into the largest machine tool builder in North America with a footprint encompassing more than 60 countries and 1,300 employees. Motorsports has played a key role in that growth, with SHR winning two titles and 46 Cup Series points races. That success led Haas to venture into Formula One in 2016, where in addition to creating the first American team since 1986, he uses the worldwide platform to build Haas Automation into a premium, global brand. Bowyer said Haas provides his drivers and teams with the tools and expects victories. “It’s never a question of, ‘What does it take financially or anything else?’” Bowyer said. “It’s, ‘What does it take to win, what does it take to be better, what does it take to find victory lane?’ Those are questions that Gene Haas asks, and that’s it. He doesn’t talk about a good top-10 finish or that you can be proud of a good run. He’ll never say maybe that was a track you struggled at when you run fifth or sixth or something. 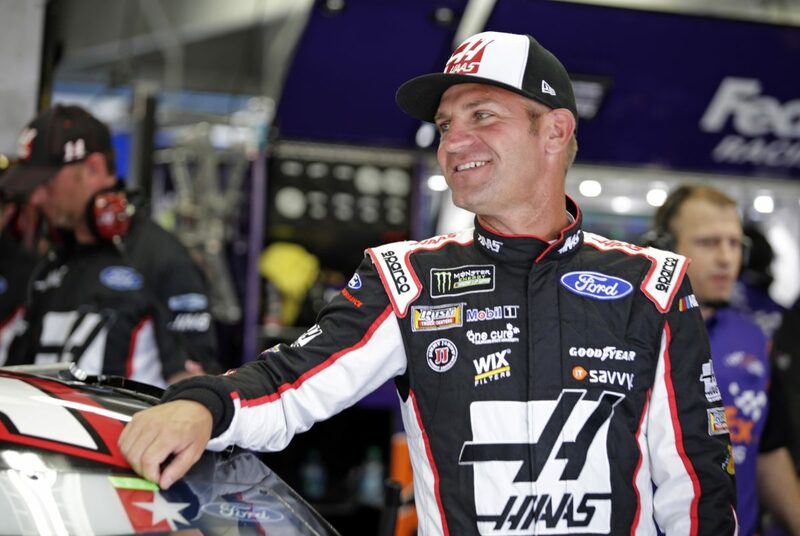 Bowyer said that attitude is contagious throughout SHR’s Kannapolis, North Carolina headquarters, as well as the Haas F1 Team that scored its best-ever finishes July 1 at the Austrian Grand Prix, when its drivers Romain Grosjean and Kevin Magnussen finished fourth and fifth, respectively – an unheard-of result for such a young team. It’s fitting that Bowyer will drive the No. 14 Haas Automation VF-1 Ford Fusion this weekend at Kentucky Speedway in Sparta. The paint scheme celebrates the 30th anniversary of Haas Automation’s very first vertical machining center – the industry-leading VF-1. Introduced in 1988 in Chicago, the Haas VF-1 established an industry milestone by being the very first American-built vertical machining center to sell for less than $50,000, an unheard-of price at that time. With a published price of $49,900 – another industry first – the Haas VF-1 quickly became the industry benchmark for affordable CNC technology. Today, the Haas VF-1 still sells for less than $50,000 – in fact, it’s only $46,995 – and Haas Automation is one of the world’s leading manufacturers of CNC machine tools with an extensive lineup of more than 100 high-value, high-performance products. Bowyer can write his name in the SHR history book this weekend at Kentucky. Despite winning 46 Cup Series races over 10 seasons, SHR has yet to win at Kentucky or Talladega (Ala.) Superspeedway. Kentucky and Darlington (S.C.) Raceway are the only two Cup Series tracks where Stewart never won a Cup Series race during his historic career that netted 49 victories and three championships. Bowyer will likely be a factor in the Bluegrass State although he has enjoyed mixed success at the track that hosted its first Cup Series race in 2011. He’s scored the 13th-most points of all active drivers in the seven Cup Series races at Kentucky, highlighted by a third-place finish in 2013. Bowyer has scored the fourth-most points of all drivers in the last five races on a 1.5-mile track. He arrives in Kentucky after a 22nd-place finish at Daytona (Fla.) International Speedway last weekend. Bowyer led two laps and was battling for the lead in overtime when contact from another car ended his race with a hard crash. It also ended a string of three consecutive top-five finishes for the Kansas native. Daytona is behind him and he’s looking forward to Kentucky, where he’ll be a contender given his recent success and the SHR “army” behind him, along with co-owners Stewart and Haas. Do you like going to Kentucky?